May 2014—Mark told elders that he was not aware of the ResultSource agreement but had chosen to admit knowledge of it for the sake of the team in his letter to the church, and that others had made the decision to work with ResultSource. He claimed that another elder and Mark’s publishers made the decision to work with ResultSource without his knowledge. He insinuated that he had learned about the ResultSource agreement only after the story broke on World magazine. 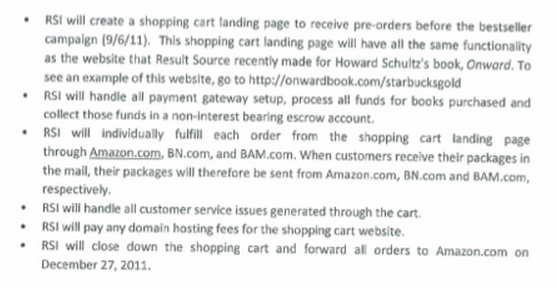 In fact, Mark agreed to work with ResultSource on the Best Seller Campaign for Real Marriage as early as July 2011. The wording of the statement makes it difficult to know when he became aware that the ResultSource scam was manipulative. Did he become aware of it after the story broke in World? Or sometime before that? Or did he know it all along? According to the former elders, Driscoll implied he didn’t know until after World broke the story. Since Driscoll is not talking to the media now, it is not possible to get his side of that story. However, there is evidence that Driscoll was warned about the nature of the ResultSource strategy before Sutton Turner signed the contract. Regarding the July 2011 date mentioned by the former elders, I have seen an email which appears to support that date although I am not at liberty to print it. However, I have recently obtained an internal memo which indicates that Mars Hill staff were concerned about the Result Source agreement well before Sutton Turner signed the deal. The memo below provides additional evidence which supports the claim that Mark Driscoll was aware of the ramifications of the ResultSource strategy before the church leaders agreed to the terms of the contract. According to sources aware of the situation, the Mars Hill communications staff raised questions with the executive elders (Mark Driscoll, Sutton Turner and Dave Bruskas) about the wisdom of the ResultSource agreement prior to October 2011. The above memo was written in September 2011, prior to the ResultSource contract dated October 13 and signed by Sutton Turner, apparently on October 17. In May 2014, I posted October 18, 2011 invoices from ResultSource which were addressed to Mark Driscoll. Driscoll told the church in March that he thought the ResultSource strategy would “reach more people with the message and help grow our church.” However, the memo above raised important questions regarding potential harm and loss which could result. The memo writer raised two important issues to the executive elders. Would the church lose money on the arrangement and is it acceptable for the church to pay retail price for Real Marriage when Driscoll could get them at a substantial discount and allow the church to sell them at a higher price. With this foundation, one can understand the concerns expressed in the memo more clearly. 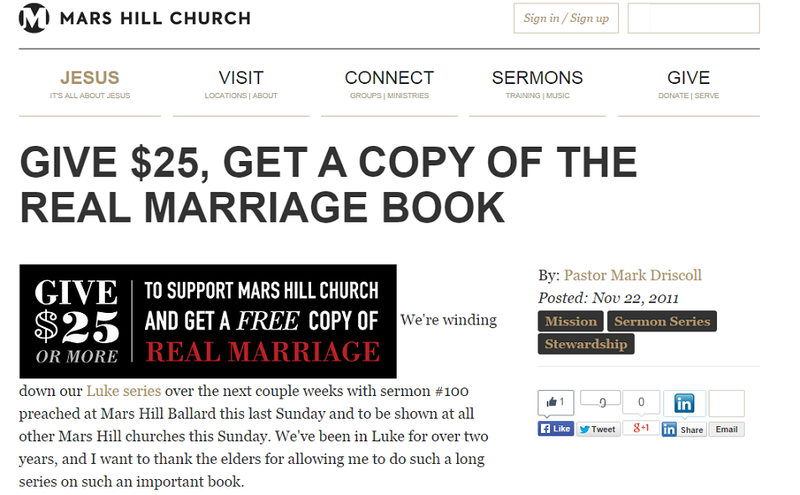 Real Marriage was being offered for a minimum price of $25. 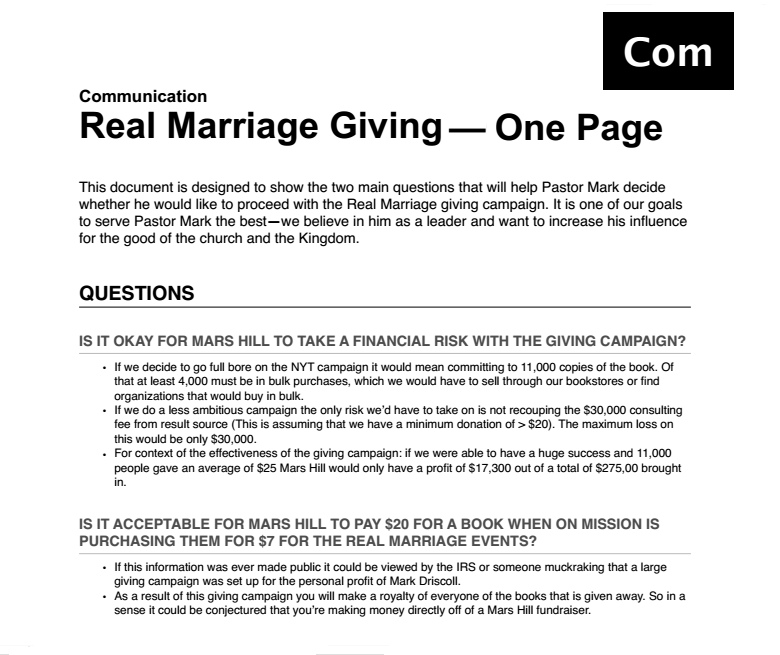 Since the books had to be purchased from retail outlets at the retail price ($20 or more) in order for the books to show up in the New York Times sales count, the profit to Mars Hill Church was meager compared to what it would have been if Driscoll had exercised his option to purchase bulk quantities at a vast discount ($7). Presumably, he made his usual royalty from the books purchased at retail. What is unknown is whether or not Driscoll donated any additional money from his royalties for the books sold in relationship to the entire campaign. In light of this information, let’s review the worries expressed in the memo: I have been told that the giving campaign did not achieve “sales” expectations. Successful or not, the campaign was set up pursuant to the ResultSource contract and managed by them. The campaign was set up to achieve Driscoll’s rise to the top of the NYT bestseller list and may have resulted in significant financial gain. 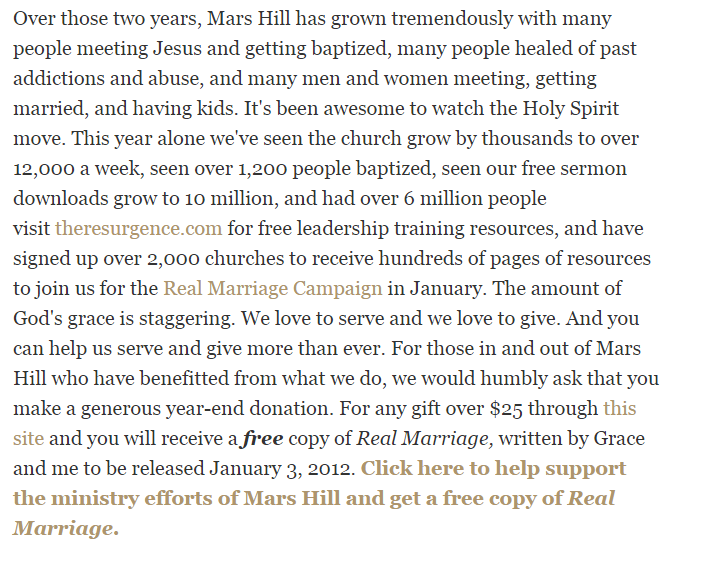 The website said that purchasers were helping the ministry efforts of Mars Hill Church. Unknown to them, they were also helping Mark Driscoll get to #1 on the NYT bestseller list with all of the resulting benefits. Finally, the memo implies that Driscoll was warned about the problems with running the ResultSource campaign through the church. The church Board of Advisors and Accountability spent money unwisely in order to benefit Mark Driscoll both via elevating his personal status and by purchasing books at retail price when those same books could easily have been secured at a substantial discount. While Driscoll said he was sorry he used the strategy, he has not directly addressed the financial consequences of the deal to the church. If the BOAA desires to repair lost trust now, I believe they need to issue a full accounting of money spent on the entire campaign, along with the resulting royalties, profits and losses.